It must be admitted that he looks dangerous. 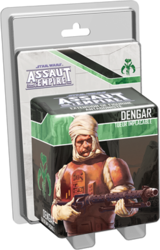 Use cold, calculating tactics during your Assault on Empire games with Dengar, Implacable Slayer. The "Infernal Tactics" Project Card Series provides the Imperial Player with new options that will fit into any campaign. This expansion also contains new Command Cards and two unique Skirmish missions to play one on one.